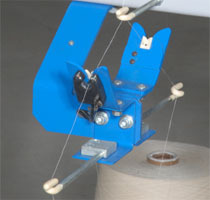 The cut and catch cutter cuts the yarn immediately after the signal from yarn detection sensor. 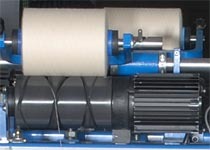 Quick response of this cutter reduces the amount of single yarn wound on the delivery package. And holds the yarn after cutting it thereby eliminates the chances of getting loose end entangled with neighborhood running yarn. And it helps the operator to find the broken end very easily. 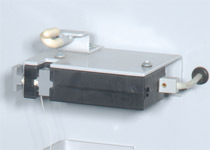 Uniform winding tension produces better packages in terms of easy unwinding. 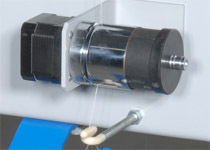 The stepper motor driven spring loaded tensioner will apply uniform winding tension throughout the package building. The tension pressure can be varied by changing speed of the rotation and by varying the spring load applied. High response Reliable non-contact type optical sensors with On/Off position indication helps an operator to know the state of spindle/sensor. This identifies the absence of yarn within few milliseconds thereby drastically reduces the single yarn wound on the package. It also reduces the wastages of yarn and reduces Operator fatigue. It can be easily programmed for all types of yarn. 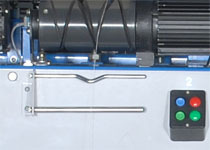 An advanced Centralized System, Controls the functions of the all spindles. 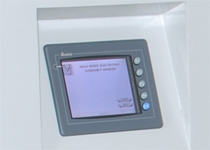 A touch display provided helps to enter parameters of all the spindles from a central position . The centralized systems and the touch display supports for Considerable time savings in entering parameters for all the spindles. Multi language option provided in the display supports for easy access of all parameters like, production details , Delivery package details and break etc by all level of the people. The main objective of the Assembly Winder is to wind two/more yarns parallel to each other. In some rare occasions, these parallel yarns get disturbed and forms splits. This splits will cause a break in twisting and thereby reduces downstream process efficiency and improper twisting. In order to eliminate the splits, an anti-splitting rod is incorporated. It will ensure that there is no packages wound with splits. 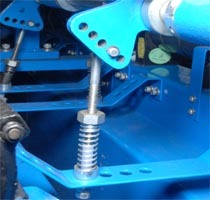 There is a mechanical arrangement to adjust the package pressure applied over the winding drum. It helps to produce required density packages. It can be adjusted according to the material and count processed.